1. Sing Hallelujah (Live At Mt. Holly) – Music & Lyrics: Rick Coghill & Joel Chernoff, Vocal Arrangement: J. Finkelstein, Vocal Direction: J. Finkelstein. 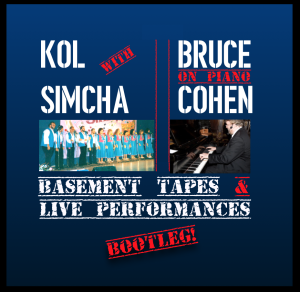 Piano Arrangement: Bruce Cohen ©Messianic Music & Messianic Publishing & Bruce Cohen respectively. 2. Shomer Yisrael (Live At Mt. Holly) – Song & Vocal Arrangement: Hasidic Folk Festival, Vocal Direction: J. Finkelstein Piano Arrangement: Bruce Cohen ©1979 Hasidic Folk Festival, Kol Simcha & Bruce Cohen respectively. CREDITS: Mt. Holly Recording Engineer: Wayne Eisenberg. Tascam (PA) Recording Engineers: J.P. Shelkin & Mitchell Fox.